The Brown Cow01274 564345work Public HouseThe Brown Cow has been serving as a hostelry in Bingley for over 100 years. This family run pub, provides traditional & innovative home cooked food, individually selected wines and award winning cask conditioned ales from local breweries. All of this comes overlooking the riverside with a stunning view of the Bingley Parish Church, where the bells can often be heard. To the other side, lies the famous St Ives estate, where we find a walkers paradise along with a championship golf course, archery & fishing as well as much more. When the weekend arrives so do the local live bands, who can often be seen on Saturday nights along side a variety of fine food and cask ale based theme nights. With our traditional Yorkshire Hospitality & local products, The Brown Cow is the perfect place to Relax, Enjoy & Return. 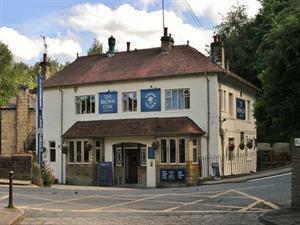 The Brown Cow has been serving as a hostelry in Bingley for over 100 years. This family run pub, provides traditional & innovative home cooked food, individually selected wines and award winning cask conditioned ales from local breweries.